By now, you've probably heard the buzz on CBD, or cannabidiol. It's a non-psychoactive compound found in cannabis plants that's rapidly gaining popularity not as a recreational drug, but for its therapeutic properties. Testimonials abound regarding its uses as a stress-reliever and sleep aid, not to mention its well-researched possibilities for pain management among cancer patients. 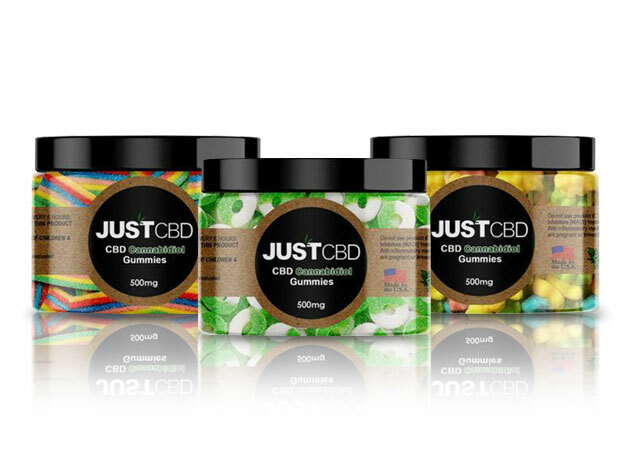 If you've never tried it, there's a suitably painless way to jump in: CBD Gummies. What you get is a jar of 50-55 gummies, infused with 99.99% hemp isolate powder, delivering 500 mg of CBD in each container. Like most gummy treats, they're fat and gluten-free and are available as sour bears, apple rings or rainbow-colored strands. Take no more than 2 every 6 hours and see how they can combat your stress level or pain. The treats contain less than .3% THC, and purchasers must be 18 or older. It's also a good idea - as with any medication - to consult with your doctor before consuming and check your state laws regarding CBD before you buy. 500 mg of CBD Gummies are now available for $29.99 - 25% off the original MSRP.